We literally get hundreds of phone calls every season from people all over the US and Canada wanting to know the best solution for protecting their vehicle battery and engine from cold start damage. We decided to post this column to educate the public of the effects of cold on engines and batteries… and to give them a practical solution for their cold weather problems. Every year, tens of thousands of Americans (and Canadians) go to start their car, truck, atv, or snowmobile… just to find that the cold outdoor temperatures have completely zapped their battery or frozen up their motor. This type of damage from cold weather is estimated in the Billions annually. Not a minor issue by any standard. So what is a person to do to combat the effects of cold and snow (temperature) on their motorized vehicles? How do you heat the entire engine compartment with a single device? Our extensive testing shows POWERBLANKET to be the most effect cold weather solution for heating motors, engines, batteries, equipment and protecting machinery from the harsh winter elements. YES, you CAN heat the entire engine compartment with a single heater! The guys and gals at Powerblanket manufacture a host of heating solutions for everything imaginable including drum heaters, tote warmers, tank wraps, gas cylinder warmers, ground thawing & concrete curing blankets, and bucket warmers… and they’re all powered by Powerblanket’s patented heat spreading technology called GreenHeat. It’s green, it’s low energy, and it’s UL/CSA compliant. Engine Blankets for every occasion. MODEL EH0304 – Powerblanket automotive & equipment warming blankets create the necessary heat barrier to ensure longer engine life and prevent “cold start” wear & tear. FULL 3’x4′ Heated Surface Area. 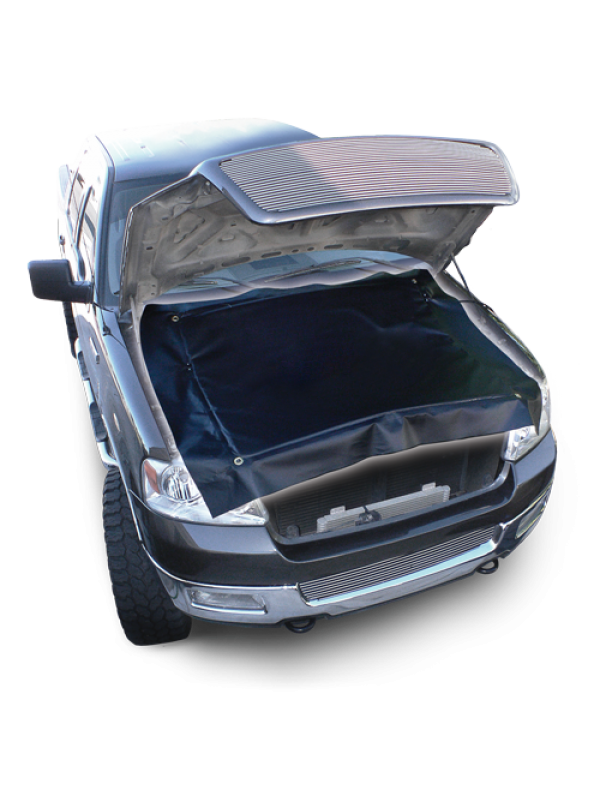 Powerblanket is an all-in-one heating solution which effectively replaces separate heating devices for oil pans, blocks, cores, hoses, fluid reservoirs, batteries, and crank cases by heating the entire engine compartment! Great for preheating autos, aircraft, service trucks, snowmobiles, hydraulic / fuel tanks, outdoor machinery, appliances, and heavy construction equipment. With over 1 million units sold… there has never been an easier, safer, or more reliable way to heat your motors and machinery. We know every degree matters and every minute counts. Powerblanket will bring the HEAT – Guaranteed! MADE IN THE USA.